Reconnect with your senses to encourage a healthy relationship with food. As wonderful as smart technology and TV is, they demand a great deal of our time. With constant notifications and 24/7 access to the Internet, it can be hard to focus on the present moment. As well as affecting our stress and anxiety levels, this lack of focus can affect our waistlines. This is because we eat mindlessly on the go, or in front of a TV/computer screen. When we’re not focusing on what we’re eating, it becomes all too easy to overeat. Research has shown that eating in front of the TV increases food intake by 18%. Mindful eating is a concept that involves slowing down and being in the present moment when eating. This encourages you to recognise the physical sensation of hunger and fullness, and really relish the flavours you taste. Doing this helps to increase awareness, so you know how much you’re eating, stopping you from overeating. Instead of obsessing over the number of calories in your meal, take a moment to check in with your senses. This will help you to establish whether or not you’re really hungry (or just bored/stressed) and how much food you need to feel full. Think about the emotions you’re feeling and consciously choose what to eat, how much and when. Embrace mindfulness in all areas of your life, not just in your diet. Start a mindfulness meditation practice. This will get you into a more mindful state of mind which will benefit your mindful eating habit. Having a strict list of foods you can and can’t eat is exhausting and more often than not you will crave the foods you’re not allowed, leading to a potential binge. The aim behind mindful eating is to improve your relationship with food and be more thoughtful about your decisions. This should allow you to maintain a healthy, balanced diet with room for the occasional treat. 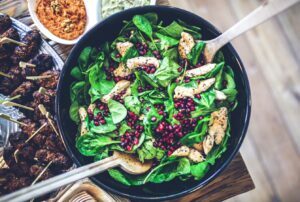 If you are struggling to change your eating habits, you may want to consider hypnotherapy. To find out more about how a hypnotherapist could help you, please read our weight loss page. What is the point of anxiety? Three simple steps to be happy now!